Outside Killer Sudoku is New Sudoku Variation which I created around 5 years back. This puzzle which I am posting, I found it created on notebook and surprising it was never published for last many years. There are many such puzzles, which I created long back and these puzzles remained on the paper. I am now trying to publish my old creations. 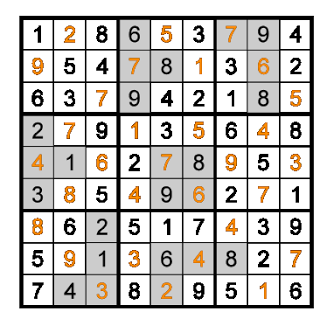 Again as this Outside Killer Sudoku is created very long, it does not follows aesthetics and looks asymmetrical. However it does follow a logical path to solve this puzzle. This Outside Killer Sudoku is my 77th contribution for The League of Extraordinary Ladies and Gentlemen. Classic Sudoku Rules apply. Additionally numbers outside the rows/columns indicate that there is at least one couple of neighbouring cells in that row/column of which sum is equal to this number.